Easy-to-use functions for downloading air quality data from the Mexican National Air Quality Information System (SINAICA). With this R package you can download pollution and meteorological parametrs from the more than a hundred monitoring stations located throughout Mexico. The package allows you to query for crude real-time air quality data, validated data, or manually collected data. It looks like there are three stations named Centro, the one we are looking for is the one in Guadalajara with a numeric code (station_id) of 102. 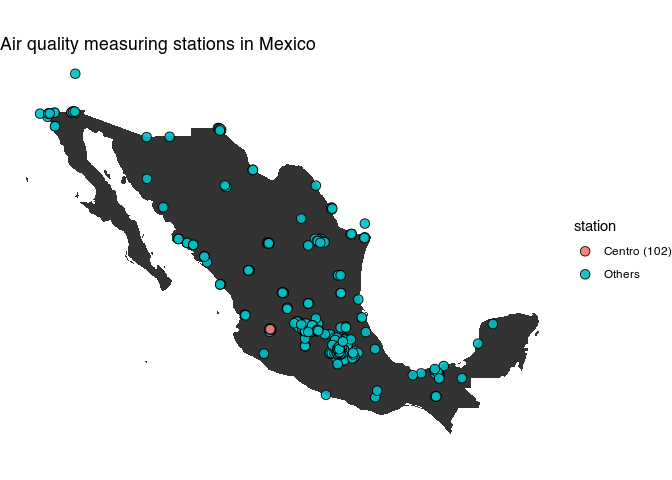 The stations_sinaica data.frame also includes the latitude and longitude of all the measuring stations in Mexico (including some that have never reported any data!). stations_sinaica$color[stations_sinaica$station_id == 102] <- "Centro (102)"
It’s currently reporting data (this document was built on 2019-02-12), and has been doing so since 1997. We can also query which type of parameters (pollution, wind, solar radiation, etc) the station has sensors for. Note that the package also includes a parameters data.frame with the complete set of supported parameters, but not all stations support all of them. 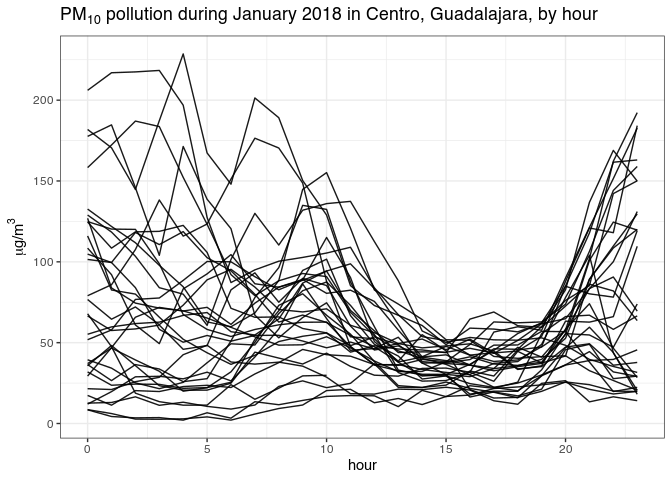 Finally, we can download and plot hourly concentrations of particulate matter with a diameter smaller than 10 micrometers (μm) (PM10) during the month of January. the hours are in the local Guadalajara time zone of UTC-6 since we plotted January data. #>  "Tiempo del centro, UTC-6 (UTC-5 en verano)"
You can find a handy map of Mexico’s time zones from Wikipedia to help you with any time conversions you might need.